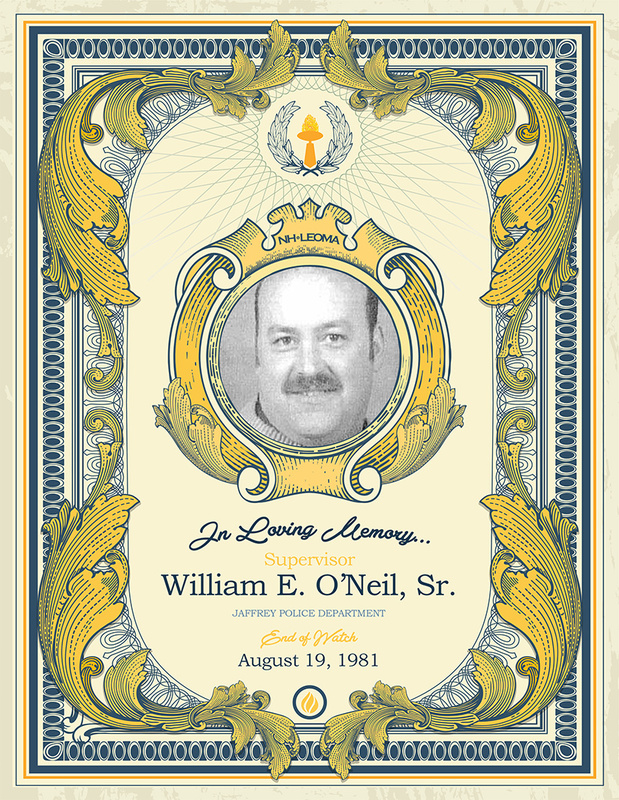 Supervisor William E. O’Neil, Sr.
Police Supervisor O’Neil was born on September 24, 1942, in Peterborough, New Hampshire and lived in Jaffrey until his marriage to Joan in 1964 when he moved Rindge and lived there until the time of his death. He graduated from Conant High School in Jaffrey in 1960. He served his country in the United States Navy as a Sea-Bee during the Vietnam War, spending a nine month tour of duty in Danang and was a member of the American Legion. He served the Rindge Police Department from 1970 to 1979, initially as a part-time police officer and was appointed as the Chief in 1978. He was also a 6-year veteran of the Jaffrey Police Department. On August 19, 1981, Supervisor O’Neil was driving in his cruiser on Turnpike Road near the Silver Ranch area responding to another officer’s request for assistance. Supervisor O’Neil’s cruiser skidded into a tree. He died from his injuries at Monadnock Community Hospital in Peterborough. He was 38 years old. He was survived by his wife, Joan, his son William, 7 and his daughter Lisa, 12.